Washington Sep 15 (IANS) At least seven people were killed as hurricane Florence made landfall in the US state of North Carolina battering the state with a powerful combination of wind and rain. Warnings were issued about the risk of life-threatening flash flooding in parts of North and South Carolina as well as in Virginia. It was downgraded from a hurricane to a tropical storm on Friday but continued to soak the East Coast area with rain downing trees and damaging homes. Some areas grappled with intense flooding while hundreds in the city of New Bern and North Carolina required rescue in the early hours of Saturday. Parts of New Bern and North Carolina were 10 feet underwater after local rivers overflowed their banks. Thousands of people were staying in emergency shelters. Evacuation warnings were issued for 1.7 million people in the region the US media reported. Florence was slowly grinding over the eastern states with winds of 65mph (105km/h). It was expected to keep lashing parts of North and South Carolina into the weekend according to the Washington Post. Up to 40 inches of rain and storm surges pushing water inland will produce catastrophic flash flooding the National Hurricane Centre said. Two people in Carteret County died due to the storm officials said. A mother and her infant were killed in Wilmington when a tree fell on their home. According to officials the child s father was also transported to hospital with injuries. The White House announced on Saturday that President Donald Trump approved a disaster declaration for North Carolina a day earlier an order that opens up federal funding including housing and home repair grants. The storm originally made landfall at Wrightsville Beach North Carolina on Friday as a category one hurricane. North Carolina Governor Roy Cooper said the hurricane was likely to "continue its violent grind for days" and described the severity of the downfalls as a "1 000 year event". 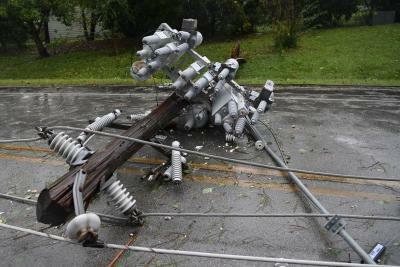 Almost 800 000 people are reported to be without power in North Carolina and officials have warned that restoring electricity could take days or even weeks.